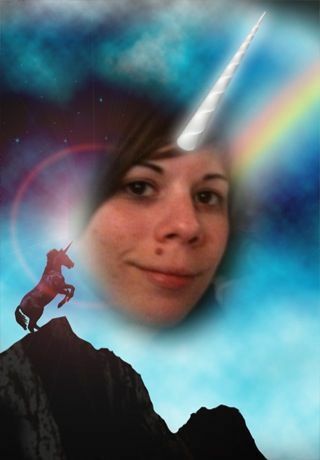 I’m sure it won’t surprise you to find out that Kristyn is also a unicorn. She knew she was a unicorn since before she met me. I actually helped her out of her unicorn closet before stepping out of my own. Together we’ve leaned on each other when times have gotten tough. When someone unicorn bashed me (aka mistook me for Mr. Ed’s wife), she was right there. When her ‘corn didn’t come out looking right in the morning, I fixed it with a curling iron. We’ve stood up for each other in the face of all forms of unicorn discrimination and now we want to lead the others into the light of the shimmering rainbow. We are unicorns, hear us roar! buberella • This entry was posted in Blah, California, Kristyn, Oh snap! and tagged OMG, Pictures, Unicorns. Bookmark the permalink.